Most eyes are focused on the national midterm elections, but don’t lose track of what’s going on here in our own backyard. Five candidates are vying for three seats on a downsized City Council and six are in the fight for two seats on the PAUSD School Board. In addition, voters face four ballot measures that are strictly local and a slew of statewide measures. 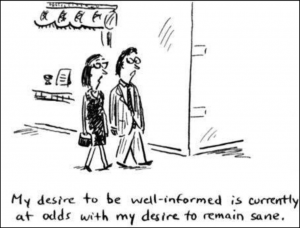 Luckily, it’s not too late to get to know where the candidates stand and catch up on what’s what. In addition to the forums and information sessions highlighted below, a look back through Palo Alto Matters’ newsletters will catch you up on the key issues and controversies that have come before City Council in the past two years. Palo Alto Council Candidate Debate: Sponsored by Palo Alto Weekly, Chamber of Commerce and others. Beginning at 7:30 pm (Cubberley Theater, 4000 Middlefield Road). A video recording of the debate will be available at Palo Alto Online. Palo Alto City Council Candidate Forum: Hosted by Palo Alto Neighborhoods (PAN). 7:00 – 9:00 pm (City Hall). Watch Online – http://Midpenmedia.org/watch – Choose Channel 75. Read the Candidates responses to PAN’s 2018 Election Questionnaire. Measure F Debate (Health Care Regulations): The League of Women Voters of Palo Alto and First Congregational Church will co-sponsor a debate featuring representatives of both sides of Measure F. 11:40 a.m. to 12:30 p.m. (First Congregational Church, Harmony Hall, 1985 Louis Road). City Council Candidates Forum: The League of Women Voters of Palo Alto will host a City Council candidates forum, co-sponsored by the First Congregational Church of Palo Alto, Palo Alto Branch of AAUW and Congregation Beth Am. 7:00-8:30 p.m. (First Congregational Church, 1985 Louis Road). Candidates Forum on Special Education/Educational Equity and Access: The Palo Alto Council of PTA’s and Parent Advocates for Student Success (PASS), will hold a School Board candidates forum. 4:00 – 6:00 p.m. (Greene Middle School, 750 N. California Ave). Candidates Forum on Secondary Education: The Palo Alto Council of PTA’s will host a School Board candidates forum on secondary education. 4:00-6:00 p.m. (JLS Middle School, 480 E. Meadow Drive). 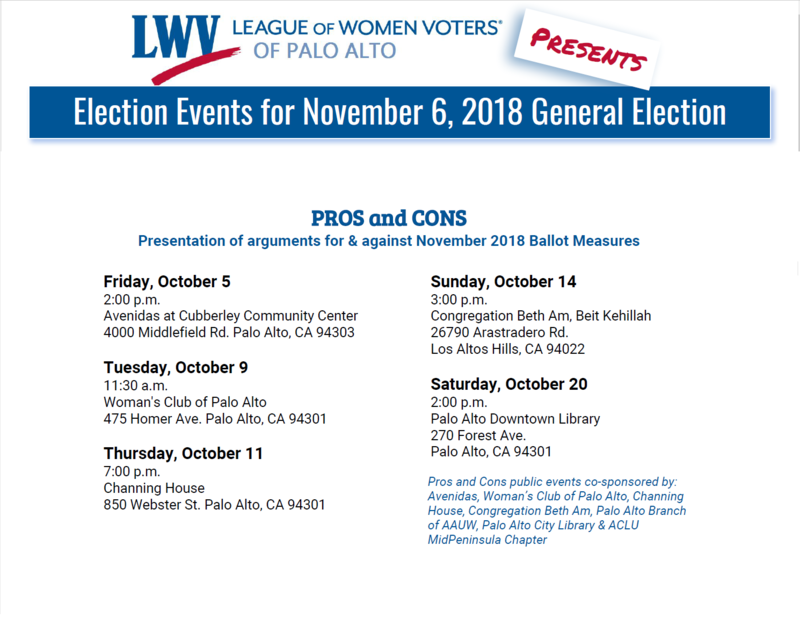 The League of Women Voters of Palo Alto will hold a series of “Pros and Cons” information sessions on November 2018 ballot measures from October 5 through October 20. Click here for more information. Council Rail Committee Meeting: Beginning at 8:00 am (Community Meeting Room, City Hall). Stanford GUP – save the date: The Santa Clara County Board of Supervisors voted unanimously on September 25 to approve new impact fee ($68.50 per square foot of new development) and inclusionary housing (minimum of 16 percent of new housing must serve below market rate residents) ordinances that would apply to Stanford. However, both ordinances will be superseded if the County and Stanford enter into a separate “development agreement” regarding Stanford’s expansion plans. The County Board of Supervisors will receive recommendations from county staff about how a development agreement might be put in place. This is an important opportunity for residents to weigh in, both on whether a development agreement is desirable and how the process could assure public transparency and participation. The County agenda and staff report will be posted on our calendar page when available. Rezoning of 788 San Antonio Road: Council will pre-screen a proposal to rezone from Service Commercial (CS) to Multi-Family Residential (RM-40) use and to redevelop the site with a three-story, 45,000 square foot residential project. Tentative, TBD.